UNCW’s arts departments will present an evening of visual art, music, dance and theater to benefit members of the campus community who were affected by Hurricane Florence. 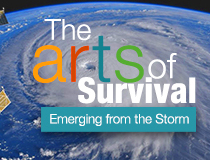 Proceeds from “The Arts of Survival: Emerging from the Storm” will go to the university’s Hurricane Relief Funds. The event, presented in coordination with the Division of University Advancement and the College of Arts and Sciences, will be held at 6 p.m. Oct. 26 in the Cultural Arts Building. Plans for the event came together within just a few days as the result of discussions between art and art history Chair Amy Kirschke and music Chair Frank Bongiorno, whose offices are next door to each other. Theatre Chair Thomas Salzman enthusiastically joined the effort. The evening will begin with light hors d’oeuvres and will feature theater, dance and musical performances, as well as an art exhibition and silent auction featuring the work of faculty, students and community members. All artwork, much of which features impressions of the storm, will be for sale along with the donated silent auction items. The night will wrap up with coffee and pastries. Tickets are $20 for general admission and $5 for students. They may be purchased in advance online, at the Kenan Auditorium Box Office and by phone at 910.962.3500. Any remaining tickets also may be purchased at the door beginning at 5 p.m. Oct. 26. To get the discounted rate, students must buy their tickets in person at the box office and bring their student ID. Two UNCW funds support students and employees affected by Hurricane Florence. The Campus Emergency Fund (Student Hurricane Relief) provides financial assistance to students. Requests and allocations are managed by the Office of Dean of Students. The Hurricane Florence Employee Assistance Fund will assist faculty and staff affected by the storm and is managed by the Office of Human Resources. Contributions and requests for assistance may be made online at this link.